When I came back from the Maldives, it took me a while to get used to the busy streets and moody people again, and surprisingly to … plastic bags as well. 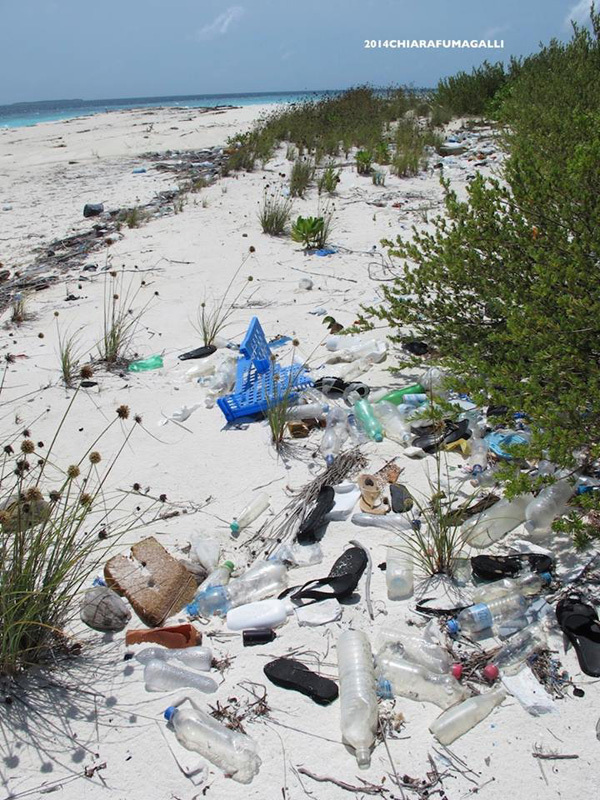 The trash on the resort islands is being taken care of, but no one cares about the deserted islands: all the trash from all over the world is just left lying around there. Picture by Chiara Fumagalli. Plastic was sort of banned on my island: the textile beach bags were provided in villas, the gift shop had paper bags only, there were no plastic ballpoint pens in the rooms – guests could make use of wooden pencils instead, and water was served in reusable glass bottles. I mean, probably all of that is done to create an image of an environmentally friendly business rather than of actual care for the environment, but it doesn’t change the fact that finding a plastic bag was a challenge on the island. That’s why it struck me when I realized how easy it was for people in cities to use plastic bags and containers. We don’t think twice when we take two separate plastic bags, say, for tomatoes and cucumbers, just to carry them to the cash counter and then home. Sure, it’s a free service provided by the shop, so we don’t actually keep count: one bag for tomatoes, one bag for cucumbers, and then as soon as we get home we throw them away into a rubbish bag (also made of plastic!). Who cares? I’m sure everyone knows that it takes dozens, if not hundreds of years, for a plastic bag to biodegrade. 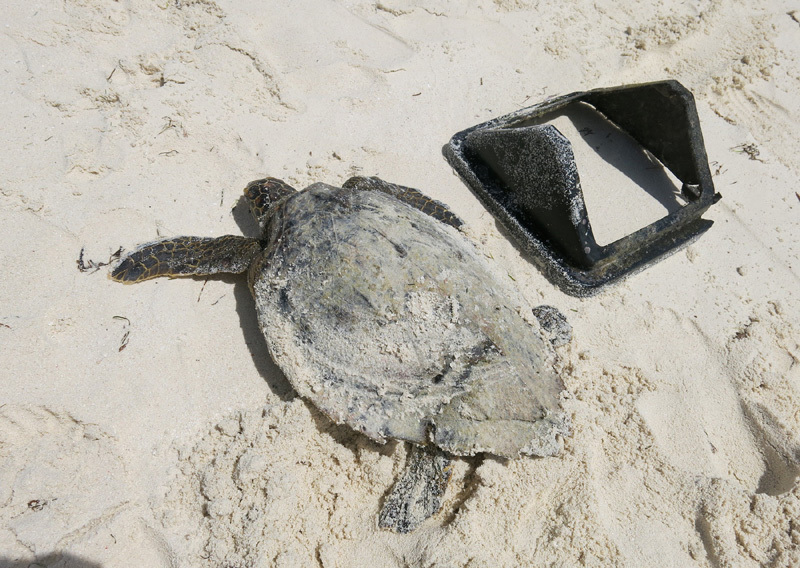 It releases toxic chemicals if burned, and if it ends up in soil or in the ocean, it stays there for ages. And it kills. 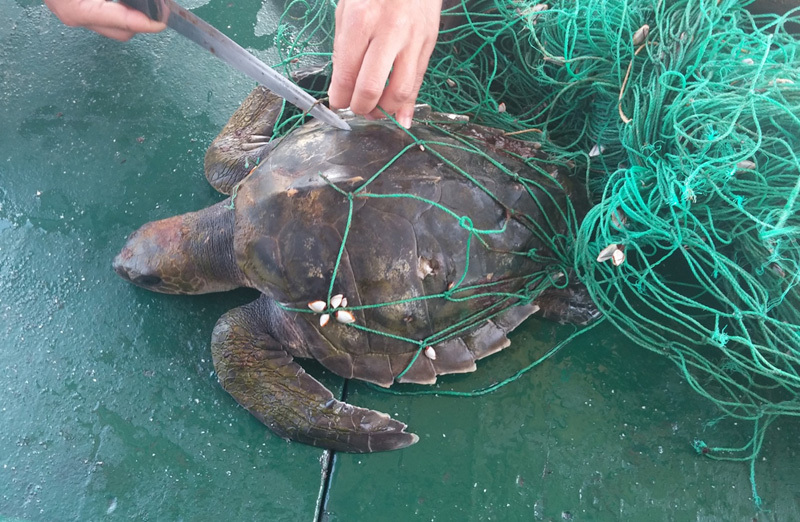 This little one was tangled in a fishing net. Picture by Chiara Fumagalli. And this one was stuck in a trash bin cover. You can see a deep cut in her shell near the left bottom flipper. Picture by Chiara Fumagalli. – get a cotton bag. Since 2011 I have been carrying a simple cotton bag with me, wherever I go. It’s still the same one, three years and counting. 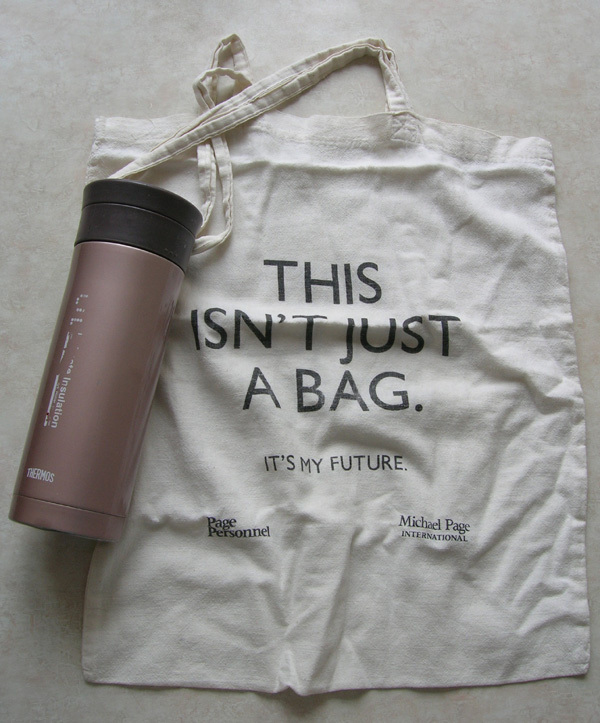 It’s very light, it takes little space in my handbag, it’s easy to wash and can carry more weight than a plastic bag. And year, the colours have faded and it looks a bit dull now, but try counting how many plastic bags I didn’t use thanks to that bag! You can buy a cotton bag in lots of shops in Ufa now, and they don’t cost much. – if you like to buy a bottle of water or a cup of coffee on your way to the office, get a little thermos instead. It really is easy to carry and it saves lots of money. I have one, and it’s always with me when I’m travelling. – try to reduce the amount of plastic bags and containers that you take from the supermarkets. Even if they are free, take only what you really need. – stop drinking beer and soda in plastic bottles, switch to juice in paper packs. It’s healthier as well :) And if you had to buy a drink in a plastic bottle, make sure to throw the empty bottle to the “recycle” trash bin. – if you are going for a picnic to the countryside, be a hero and take regular cutlery and plates, not the one-time use plastic ones. Sure you’ll have to wash the dishes when you get back home, but just think about the damage all those plastic containers and folks and cups will cause to the environment! And, obviously, don’t forget to clean up after the picnic is over and take care of the rubbish: don’t leave it behind. 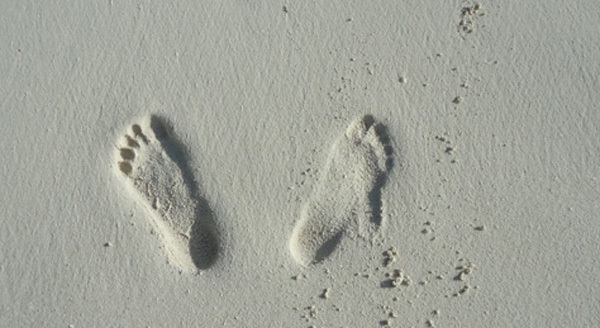 Take only pictures, leave only footprints. Remember this motto whenever you go travelling. – call your houselord and ask him where the nearest “recycle” trash bins are, ie find out where you can get rid of plastic bottles, used batteries, lamps etc without poisoning the environment. Did you know that even shampoo bottles can sometimes be recycled these days? If your landlady can’t help you on-the-spot, at least she will know that people are curious about these things and maybe will try to find out. – learn to care about the environment. I’m not joking. Always keep in mind that it’s our planet, our home we are talking about, and it’s our responsibility. Stop being part of ‘consumption society’ and start thinking about the Earth and its inhabitants. If you do that, the rest will come automatically, and you’ll never forget to switch off the lights in your flat when you go out, and leaving the water on when you brush your teeth will seem weird. Respect the nature. I have always been thrilled by flash mobs. Strangers plotting an event on the Internet and then gathering at the same place at the same time to do the act for no particular reason? Seems almost rebellious and very tempting to me! I even wrote an article about flash mob for our team website. 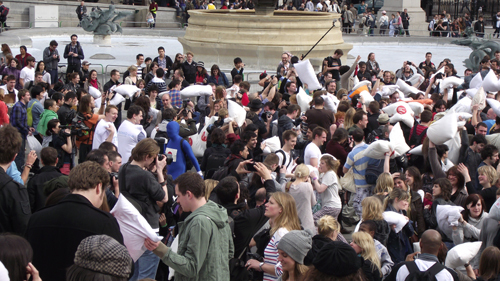 So when a friend invited me to take part in the International Pillow Fight Day on Trafalgar Square, I decided to go. I was looking forward to seeing the shocked and amused faces of unsuspecting public when we suddenly would take the hidden pillows out of our bags and start swinging at each other. But when we came out of the Charing Cross tube station ten minutes before the appointed time, I was so disappointed that all the cheerful mood was gone. For those in the center of the fight, it must have been an unforgettable experience. But if you hear that a real flash mob is about to happen around the town, please let me know. Alex Watson: Who is your master? At last someone brought the question up. Who are journalists writing for today: readers or Google? Our Thursday guest speaker, Alex Watson from Dennis Publishing, addressed some of the issues of media business during his lecture at the University of Westminster. So, Alex was talking about the fact that journalists today (as always) like being read. However, unlike ever before, in the 21st century they can increase their readership not only by producing outstanding content, but also by understanding SEO (=how Google works). For example. Search engines like websites with frequent updates. They also like keywords. Thus news websites try to produce as many news pieces a day as possible, and make sure the headline and intro and subheads are stuffed with keywords. As a result, they do get better “stats and hits”. Which is “very seductive”, Alex said. We can argue here whether going for quantity instead of quality is good or bad (bad, of course! ), but we have to admit that it works perfectly well for many companies. Hence the first question a publisher should ask himself is: “What is our business model and our digital strategy?”. 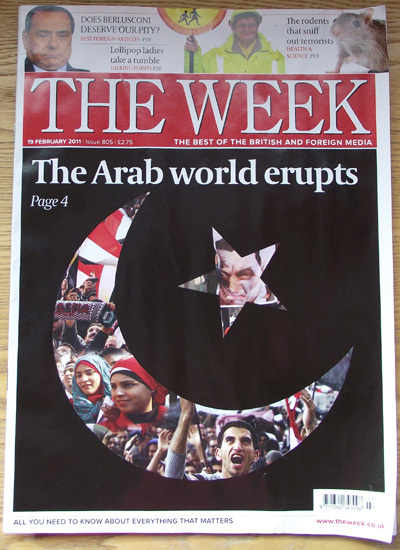 “The Week”. I think it’s brilliant, seriously. And their slogan was written by a genius: “All you need to know about everything that matters”. Think about it: they sell the pleasure of not having to look through tons of webpages and deciding what’s important! Oh, the luxury of having all “the best of the British and foreign media” (another tagline) delivered to your door on a Saturday morning, sorted and neatly packed! No wonder their circulation is going up. What ties the US President Barack Obama, a Hungarian kingfisher and Ceci, a tango dancer from Buenos Aires? Moments of their lives are engraved in photographs that have become part of the 53rd World Press Photo Exhibition. It brings together more than a 100 striking pictures taken by international photojournalists everywhere in the world from Antarctica to Greenland. All of them won prizes in World Press Photo Contest, the world’s largest and most prestigious annual press photography competition. Every year following the contest, the winning images go on tour around the globe. Londoners and guests of the city can join the ranks of worldwide audiences of this splendid free collection in the Royal Festival Hall. This exhibition is not about advanced technologies in modern photography or which picture has the best composition and angle. All of that might be important, but once you see the images all you can think about is their content, world tragedies and little everyday dramas they show. A picture by Kent Klich from Sweden depicts an empty room with grey walls, two sofas, a cupboard, and a big hole in the roof. It is very simple and looks almost peaceful. But when you look at it again having read the description, the photograph makes your hair stand on end. The house was hit by a tank shell in northern Gaza. The family that lived in the house had fled during the Israeli attack. But the 39-old father had returned to fetch clothes for his children and was killed when the shell struck. There are pictures that are shocking, revolting, confusing, desperate. There are some you wish you did not see and the ones you would like to see again and again. There are none that leave you indifferent. In fact, some of the pictures are so powerful that I would not recommend the exhibition to children and sensitive people. The majority of pictures that show horrors of war are extremely distressing. Some of them are very detailed as well. I have seen teenagers, businessmen and old ladies looking at them with the same tension and anguish in their eyes. It is the pain of discovery, the pain of empathy. This exhibition is a magnifying glass that focuses on burning issues and unreported problems of the world. You will leave it with a heavy heart, but enlightened. 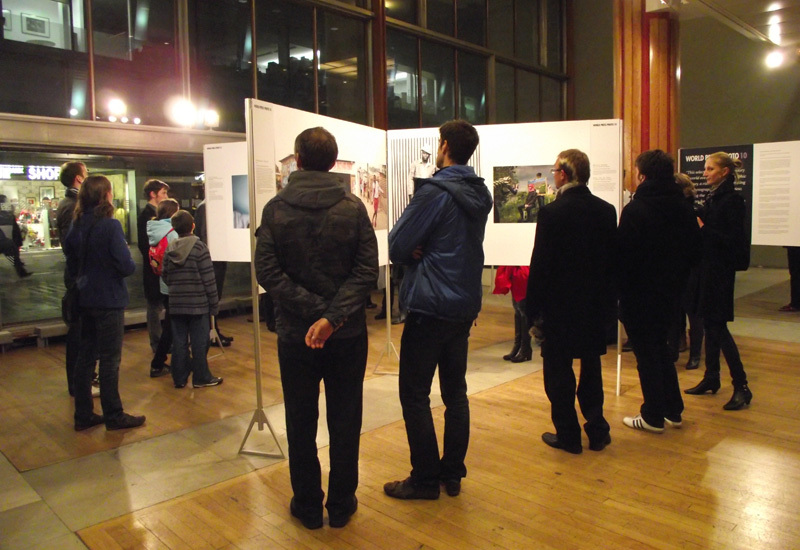 The exhibition is open daily, Friday 12 Nov – Sunday 5 Dec, 10am – 11pm. Royal Festival Hall, Southbank Centre. Waterloo tube station. I know many of us international students have already started exploring the UK. I would strongly recommend you Dover as a place for a great day outside London. We went there on a Saturday in January. It took us only 2.5 hours to get to Dover town centre from Victoria Coach Station (train journeys take even shorter time). The trip is quite cheap as well, just around 15 pounds for a return ticket. There are several places of interest in Dover, including the port, The Bronze Age boat at the local museum and the Roman Painted House. But you can’t see all of them in one day, so we decided to visit just two most famous sites: the White Cliffs of Dover and Dover Castle. A two miles’ (3 km) walk from the White Cliffs visitor centre to South Foreland Lighthouse is a great way to work up an appetite before your lunch. But please dress wisely! Don’t let the wind bother you while you enjoy the beautiful sights of the celebrated White Cliffs of Dover and the Straight of Dover. If you are lucky to be there on a sunny day, you might even catch a glimpse of France on the other side of Pas de Calais. On your way back (towards the castle) don’t forget to stop and take a picture near Blériot memorial. It is a small flat monument in shape of a plane to mark the spot where Louis Blériot landed after the first cross-Channel flight in 1909. Dover Castle is a place to spend the whole day in, as there is so much to explore. Unfortunately, it was so windy the day we went there, that the castle was closed until afternoon. And even then they didn’t open the freshly recreated 12th-century Great Tower… So check the weather before you travel! Although we didn’t have much time, we still saw quite a lot. The sight of ancient ruins like the Roman pharos (lighthouse) always gives me goose bumps. I felt the same kind of awe when I saw Egyptian pyramids and the Stonehenge. The tour around the Secret wartime tunnels was quite creepy, as they did manage to capture the feeling of the underground war hospital. The atmosphere, the looks and sounds are all there to make you – with a little help of your imagination – feel the routine of struggle, pain and anxiety of the Second World War. And then the views of the whole fortress, and the views from it, are splendid indeed. It’s a place where centuries meet and where everyone can find something to be amazed by. *It will be open Friday to Sunday from 11 March to 31 October 2011. 3) Some of the blogs may lack pictures and be less than 350 words. It is amazing that, although the book was first printed in 1999, the principles of Writing for the Web he talked about 10 years ago are still valid. That’s two thumbs up to the author. However, I wouldn’t write a blog just to say how shrewd Mr. Nielsen was. 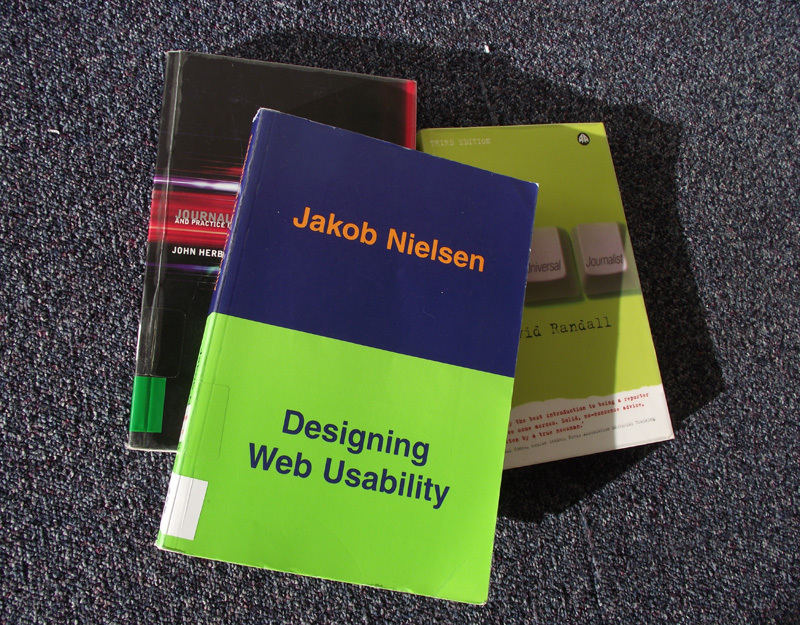 (Jakob Nielsen, Designing Web Usability. New Riders Publishing, 2000. Page 5). The ultimate example of usability: a book. When I read that, I was sooo happy we were approaching 2011 and his prophecy (at least this one) did not come true. Yes, there are now ipads etc. which people say are very cool and convenient to use. But I guess no one will argue that books didn’t go away. People who believe that books must die face a great challenge indeed. They have already made the screens very small and paper-like, you can even ‘turn over the pages’ now. But you still cannot mark important lines with a pencil, throw it across the whole room to your friend or let it slip off your armchair in case you fall asleep while reading, read it in a place where there is no constant source of electricity, and buy it for one pound. And don’t forget we can still read Johannes Gutenberg’s editions of the Bible, more than five hundred years after printing! Besides, screens are not healthy. I, for one, get a terrible headache when I spend hours reading those highly scannable webpages. I am not a doctor and can be wrong here, but my guess is that my brain is not capable of digesting the amount of data that goes into it in a short space of time when you scan online texts. Neither my eyes are, to be frank. I wish I could have a quick look into the future to see if books will survive. I hope they will.